When my daughters were toddlers I always allowed them to experience everything from touching different fruits in the grocery store to taking them to enjoy a day at the art museum and then a really fun lunch afterwards. I loved letting them learn through actual experiences and I still do. 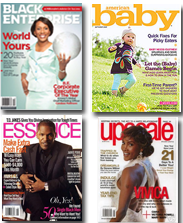 And I always supplemented their learning experiences with books. 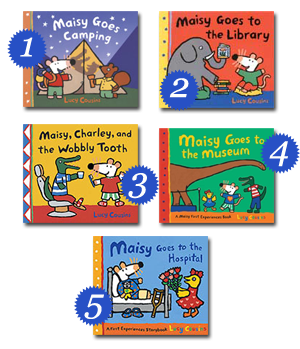 Candlewick Press has come out with five really wonderful experience books with one of kids’ favorite characters: Maisy. Brilliantly illustrated and masterfully written for toddlers, Lucy Cousins brings to life everyday situations from visiting the library to going to the dentist that little ones can learn from and enjoy. Priced at $6.99 there great to purchase as a set. 1. Maisy Goes Camping: Five in the tent! A camping trip with Maisy turns into a slapstick comedy of errors in this hilarious picture-book adventure. 2. Maisy Goes to the Library: When Maisy goes to the library, it seems like the perfect place to read her story in peace. But, Maisy finds the library full of noisy surprises. 3. Maisy Charley, and the Wobbly Tooth: On his first trip to the dentist, Charley gets lots of moral support from Maisy and friends in a full-length story readers will be eager to sink their teeth into. 4. Maisy Goes to the Museum: From woolly mammoths to rocket ships, the marvels of a museum are more fun to explore when Maisy leads the way. 5. Maisy Goes to the Hospital: The perfect prescription for preschoolers who may be visiting the hospital — and a healthy story-time choice for Maisy’s loyal fans.